During Tuesday night’s city council meeting Mayor TenHaken asked councilor Brekke to ‘Whip the Vote’ (FF: 1:02). It didn’t go over well with Brekke. She made it clear to him that’s not how things work (in municipal government). The council has the right to bring legislation forward before the meeting or to ask for a reconsideration during the meeting. 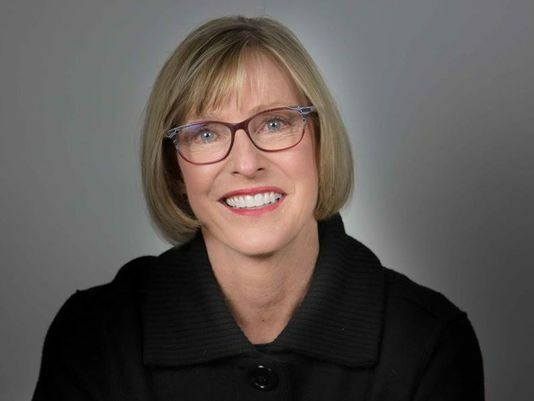 Brekke had already talked to her fellow councilors about the plurality ordinance in advance, when it failed she tried to amend it. This happens on the fly. While it is a positive thing that PTH realized he was in the wrong and apologized to Brekke (I guess in a public setting) it still doesn’t change the fact that we have a very partisan City Administrator. City government doesn’t work like Washington, there are distinct differences. It is a non-partisan form of government set up to serve all involved, the taxpayers of our city. We don’t want them to vote on ‘party lines’ because there isn’t any, but seems for the last several years the councilors belong to either the Developer Class Party or the Citizen Party – a terrible divide. This goes back to the mayor not knowing his roles and duties under charter. He is the city administrator in charge of making sure the city operates smoothly within the budget set forth. In other words, he is the employee manager. It is NOT his job to set policy. He should not even have voted on the ordinance. It should have just failed on a tie. I think if the mayor wants to get involved in policy votes he needs to explain his vote. He knew well in advance that he might have to break the tie, he also expressed to the media he would probably vote NO if the opportunity did arise. So tell us why? I don’t think he knew why, because it was just another vengeance vote with the other 4 councilors. A horrible way to set policy, I’m sorry to say. Councilor Brekke talks the topics of the day including electric cars and transport. It was also interesting that Janet brought up that communities along the Big Sioux River watershed ALL need to be responsible when it comes to cleaning up our waterways. Tell that to the state and Madison who brought TruShrimp in (due to the lack of strict discharge regulations that Minnesota has). She also brings up that the City Council should be setting the policy for the city, (NOT the mayor’s office). Did Minnehaha County Commissioner Barth get sidestepped? (FF: 31:00) The County Commissioners each are appointed to different departments. One of departments under Barth’s direction is Emergency Management. There has been a behind the scenes movement to move Emergency Management to a different location in which Barth had no knowledge of. Listen to Commissioner Beninga try to dig himself out of a hole. 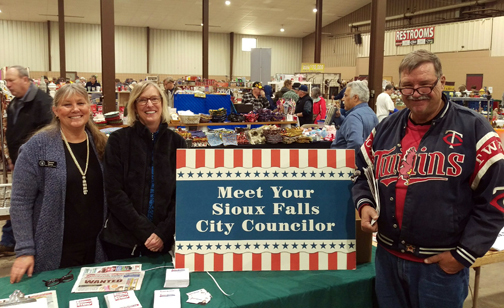 As you may have saw a few weeks ago, Sioux Falls City Councilor Brekke was troubled about how the council came up with their legislative priorities. Commissioner Barth has also expressed that he wasn’t to happy about the fact that Council Chair Erickson and Commission Chair Heiberger cooked this up together without input from other councilors and commissioners. Seems leadership is going to some people’s heads pretty quick. Janet was the latest guest on the program. She talks about her future goals as a council member. LISTEN HERE. Michelle sent this email to people on the letter, the media and some city managers. Michelle seems to think it was pointed at her, yet I find no mention of her in the letter. Guilty conscience perhaps? 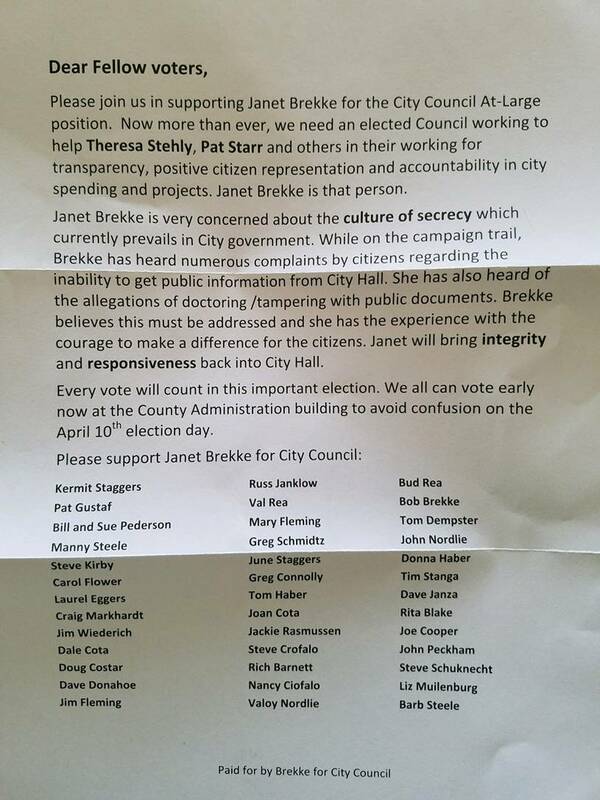 There were also rumors going around that Brekke’s competitor’s supporters were planning on filing charges against Brekke for sign compliance issues, until of course we showed almost all the candidates were out of compliance. 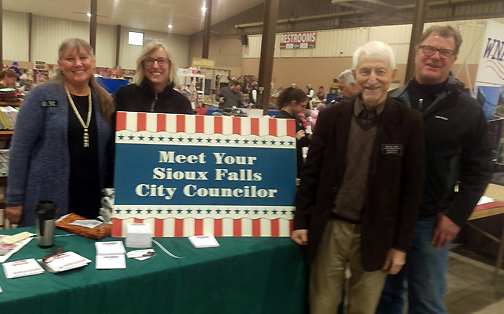 As I near the end of my eight years of service as the elected representative from the Central District on the Sioux Falls City Council, I’m incredibly proud of the positive changes I have been part of. I’m even proud of our new event center, which I fought hard to have built in a different location than where it is performing so successfully for our community. I think Sioux Falls is a better place now than it was eight years ago. I’m also happy to be stepping aside to allow for new leadership to help continue the momentum of growth and prosperity in our community. But I’m terribly disappointed by the rhetoric I’m seeing in this year’s municipal campaign. Several personal friends received the letter attached to this message. They noted it appears to have been sent by the same direct mail firm that candidate Janet Brekke has used for her other mailings, making it a mass mailing that went to a significant number of people. As a signer of this letter and a person I hold in high esteem, I have one major question. Does this letter represent allegations you are willing to stand by and support publicly? I’m doing this by email so that you can respond to me in writing with the reasons you have allowed your name to be associated with unfounded rumors. In particular, this letter charges city government — and by extension me — with doctoring/tampering of public documents. This letter is full of allegations, but the tampering with public documents charge should be easy to prove and is most hurtful to me as an individual whom I thought you trusted. Please respond back to me by email with the proof you have that convinced you to drag me through the political mud at the end of eight years of public service. I am copying a couple of friends in the local media as well as the city attorney, just as a precaution. Your allegations are harsh and personally embarrassing for me.